So where did it all go wrong for Echo & the Bunneymen? Back in 1986 they appeared to have the world at their feet, but two short years later they had split up amid poor sales, political infighting and a struggle to find a drummer. Formed in Liverpool in 1978, the band had “Paid their Dues” over the following years, building up a sizeable, loyal following with their gruelling gig schedule. Their debut album Crocodiles, with its Velvets/Doors/New Wave musical leanings and darkly oppressive lyrics had been warmly received by both the press and public. The band had ridden the wobble caused by the rather less accessible second album, before attaining mainstream success with their 1983 collection Porcupine and its concurrent singles (Back of Love, The Cutter, Never Stop); all three of which broke into the top 20. 1984 brought their masterwork, Ocean Rain and a sell-out UK tour. The band consolidated these successes with the Gold-record garnering compilation Songs to Learn and Sing; a new recording from this collection Bring on the Dancing Horses providing the lads with their seventh consecutive top 30 placing. And then it all started to go more than a little awry. The band rather unwisely chose to take a year off, and found it extremely difficult to pick up the baton when they returned to work – although the cause was hardly helped by drummer Pete de Freitas’ ongoing substance abuse issues. When they finally succeeded in cobbling together a new album, simply called Echo & The Bunneymen, it was an overproduced mess which, not surprisingly, failed to sell in anything like the numbers of its predecessors. In 1988 lead singer Ian McCulloch quit the band, shortly before de Freitas lost his life in a motorcycle accident, and the band were effectively no more. Although, as is often the case, there were multifarious reformations and reincarnations over the years – each more derisible than the last. So – back to my original question. Where did it all go wrong? 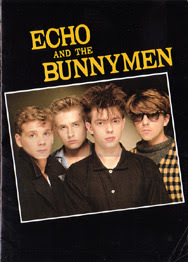 Well I have a theory, (which is Mine, and belongs to Me), that Echo and the Bunneymen’s inexorable decline began around 9PM on Friday October 12th 1984, when Ian McCulloch attempted to knee one of their fans in the nuts. The gig that evening had begun promisingly with some odd taped Gregorian chanting type stuff leading into a fine version of Nocturnal Me. An excellent My Kingdom followed, with de Freitas’ drumming propelling the thing along sublimely. We had just enjoyed the atmospheric delights of Ocean Rain and The Killing Moon, when the band attempted to cranked up the atmosphere a touch more with The Cutter. But just as McCulloch was about to launch into the chorus a fan jumped onstage, grabbed the mike and bellowed “Spare Us The Cutter”, before being swiftly huckled offstage by a roadie. At which point McCulloch, clearly pissed off at being interrupted, calculatingly aimed a knee at the lad’s groin. What got me was McCulloch had not done this as the guy approached him, nor when he had the mike grabbed from him, but only once the interloper was securely half-nelsoned by the burly roadie. And I remember thinking “What a cowardly thing to do”. The band restarted the song, and everyone carried on as if nothing had happened. But I could not forget that sly little attempt to hurt the stage invader – not in self-defence, but a calculated attempt to punish. And I sometimes wonder if I was not the only chap in the hall who came away from proceedings more than a little disillusioned with E&TB, or to be more precise Mr McCulloch. And pondering whether what went on was perhaps an indication of a growing arrogance and complacency within the band. After the incident the rest of the gig, for me anyway, just seemed a bit flat, even though roof-raising renditions of Crocodiles and Over The Wall soon followed. There was, rather typically for EaTB perhaps, no place in the set for hit singles Silver, Never Stop or Back of Love, although they did find space for a brace of b sides: Angels and Devils and Do It Clean. But it was the knee/scrotum interface incident which is my lasting memory from the evening.